For our evening workshops at Media Arts Center, we've slowly been reaching our goal of having our calendar ready 3 months in advance. We have just reached having it all set one month- the workshop type, instructor, goals, marketing, scheduling, etc are currently ready one month in advance. We have had great turnouts for Final Cut workshops and build-it-with-others workshops like the DIY Steadycam. New volunteers are increasing, thanks to new volunteer recruiting/policies we have established. The next step for our workshops is to redesign our brochures/marketing. We need to be more appealing to younger audiences, cut costs, and create new job descriptions for volunteers/interns. This begins mid-december. As for tracking technology, I had to start from the very beginning. The current inventory spreadsheet was missing crucial information including serial numbers and price values. I was able to finally utilize the snazzy barcode scanner I purchased to make the task a lot easier. The information is almost 100% entered in and will benefit accounting, identifying outdated technology, and our equipment rental process. Audits? Easy. Grantwriting? Simple! Equipment rental? Sure, let's see what's available! By the end of January, I hope to have finalized a working rental system that incorporates barcodes into our equipment inventory and member databases. I'm hoping by the end of my year here, we can have a reservation system available on our website, and maybe even a mobile app. 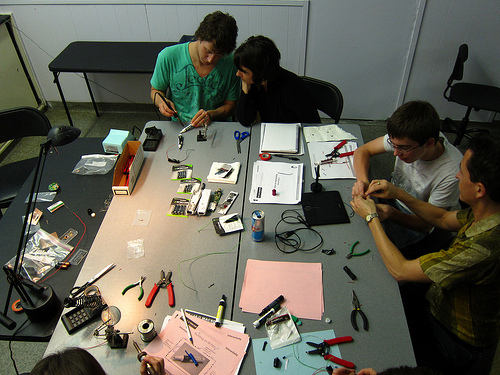 On Tuesdays, FabLab offers design workshops of all sorts. They have vinyl cutter, laser engraving, 3D scanners...man!!! I joined their fun last tuesday @ Intro to Interactivity. We made IR pens to make DIY smartboards. It really works! !